Barcelona sauntered through to the quarter-final of the Champions League as Messi's family celebrated the birth of baby Ciro last weekend, which saw Lionel Messi miss last Saturday's trip to Malaga. But he was back for the Champions League clash with Chelsea on Wednesday night and he opened the scoring after 128 seconds, slotting the ball through Thibaut Courtois' legs and racing off to celebrate and to dedicate the goal to his newborn son. Individual errors pockmarked Chelsea's performance from the outset. After three minutes, Messi threaded the ball through Thibaut Courtois' legs from an angle that seemed impossibly acute. Seventeen minutes later Messi snatched the ball from a dawdling Fabregas and squared it to Dembélé. The 20-year-old took a touch to gain composure before firing the ball in to the depths of the top corner. Marcos Alonso hit the post with a free-kick shortly before half-time and was denied a penalty five minutes after the interval. Chelsea were inferior, but also luckless. 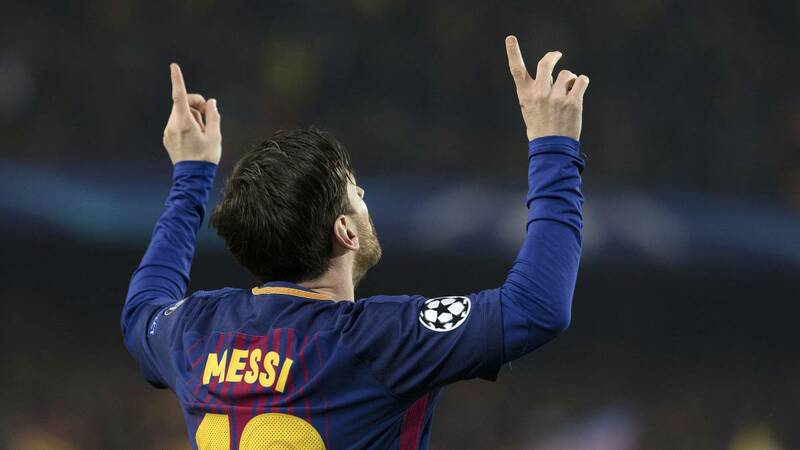 There was a sense of inevitability when Messi picked up the ball 30 yards out and skipped around two Chelsea players before firing the ball through Courtois' legs for a second time.